The oldest surviving reference to Arthur’s final resting place to provide any specific details concerning his burial is an anonymous work written in the thirteenth century. Entitled The Death of King Arthur, its author claims to have taken his theme from an earlier Welsh poem, perhaps one similar to the Song of Llywarch the Old. The work, preserved in a manuscript catalogued as Beinecke MS. 229 at Yale University, maintains that although Arthur died on the Isle of Avalon, he was buried back on shore, “within the black chapel”. It even describes the burial site as a tomb rather than a simple grave: “On the marvellous and rich tomb there was writing, saying: ‘Here lies King Arthur, who by his valour subjugated twelve kingdoms.’” Presumably the epitaph referred to the kingdoms of the Anglo-Saxons, and might relate to the twelve decisive battles recorded by Nennius. 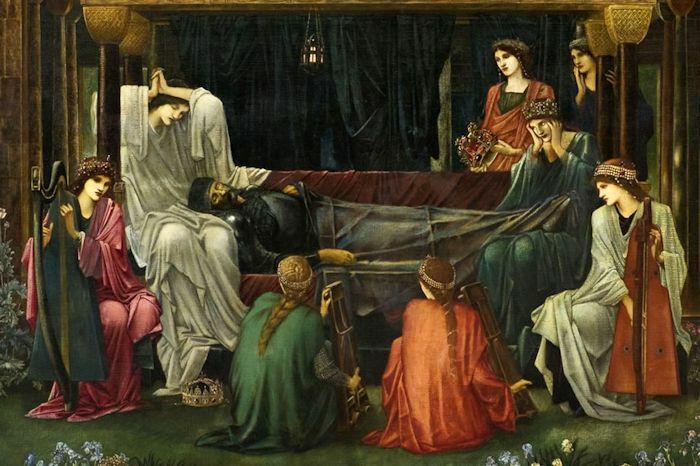 Another tradition concerning the epitaph, which was included in Sir Thomas Malory’s famous Le Morte d’Arthur was that it read: Hic Iacet Arthurus Rex Quondam Rex Que Futures – "Here Lies King Arthur, The Once And Future King”. According to Malory, Bedivere was the man who threw Excalibur into the lake. When the sword is thrown, the arm of a mysterious water nymph - the Lady of the Lake - rises from the surface, catches the weapon and takes it down into the watery depths. Malory certainly didn’t invent this theme as it is included in the Beinecke manuscript. Although it sounds like myth, this story could have been inspired by a historical event. As part of their funeral rites, the ancient Britons threw warriors’ treasured possessions into lakes as offerings to a goddess to grant them safe passage to the afterlife. Archaeological excavations have unearthed many precious artefacts, including swords, that had long ago been thrown into sacred lakes and pools by the Celtic people of Britain as offerings to water deities. The theme of Excalibur being thrown to the Lady of the Lake, therefore, could well have derived from the ancient Celtic practice of making a sacred offering to a water goddess. The early British Christians continued this custom, but regarded ancient deities as saints. 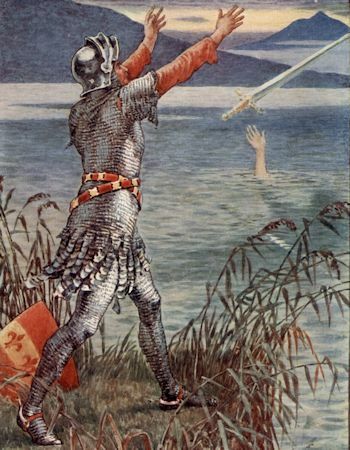 The most important point concerning this episode in the search for Arthur’s tomb is that the narrative implies the lake into which Bedivere threw the sword was the same lake in which the isle of Avalon stood. So it would seem that the chapel in which Arthur was buried stood beside this lake, and not on an island within it. 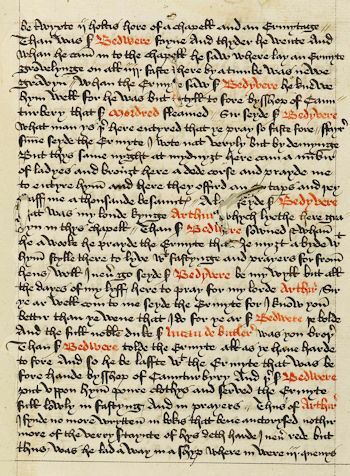 Right: Page from Sir Thomas Malory’s Le Morte d’Arthur, describing how King Arthur was buried in a tomb in a chapel near the isle of Avalon. Malory recounts how Bedivere remained in the chapel as a hermit to watch over the king's last resting place for the rest of his life. Excalibur aside, Graham now had a firm lead as to where specifically to look for Arthur’s grave. If the medieval legend was based on an earlier Dark Age war-poem, as the author maintained, then it would seem that Arthur’s tomb was originally believed to have been close to the lakeside. And if Graham was right about Baschurch being Arthur’s final resting place, then it would seem to be somewhere beside what had been the original lake, not on the island that is now Berth Hill. Might the historical King Arthur’s sword – the real Excalibur - still survive in the area surrounding The Berth? An elaborate exploration was initiated to examine the bed of the largest of the pools that remained of the original lake. The team, led by forensic marine archaeologist Ruth McDonald from Liverpool University, included both surface technicians with specialist equipment in a boat, and underwater divers. Unfortunately, although a deep-penetrating magnetometer revealed promising readings, the murky water together with the glutinous sediment of the lake bed made it impossible for the divers to identify the source of the readings. It was always going to be a long shot, but further technological developments could well make the search easier. 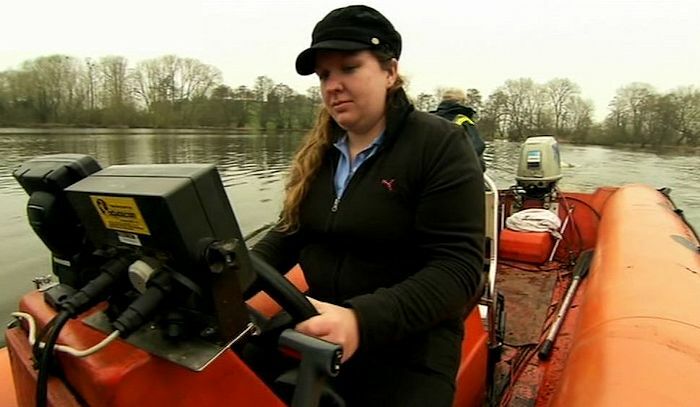 Forensic marine archaeologist Ruth McDonald uses state-of-the-art technology to survey the lake at Baschurch in Shropshire during the search for the historical Excalibur.